Where is the money in EFSF to support Bank Bailout ? 3. Stock market rally on the last day of summit. European leaders have agreed to use EFSF to bailout banks till ESM is ready. The EU vested on the Eurogroup the responsibility of implementing the decisions made at the summit by July 9, 2012. Things in Europe tend to take forever, and a single bank supervisor could take more than 6 months to implement, which could delay the proposed changes to Europe’s bailout funds. Still the question remains, where is the money in EFSF to support bank bailout? Out of 440 B from EFSF, 192 B was used to rescue Ireland, Greece and Portugal. 125B is assigned to Spain. Cyrus is seeking 12.5B bailout. The total liabilities on Spain and Italy's balance sheet is 2.4 trillion. After Spain and Cyprus bailout EFSF will have less then 100 B. This market will tank again, once more detail will come out about this new proposal. As a day trader one should focus to capitalize on this rumor and reality. 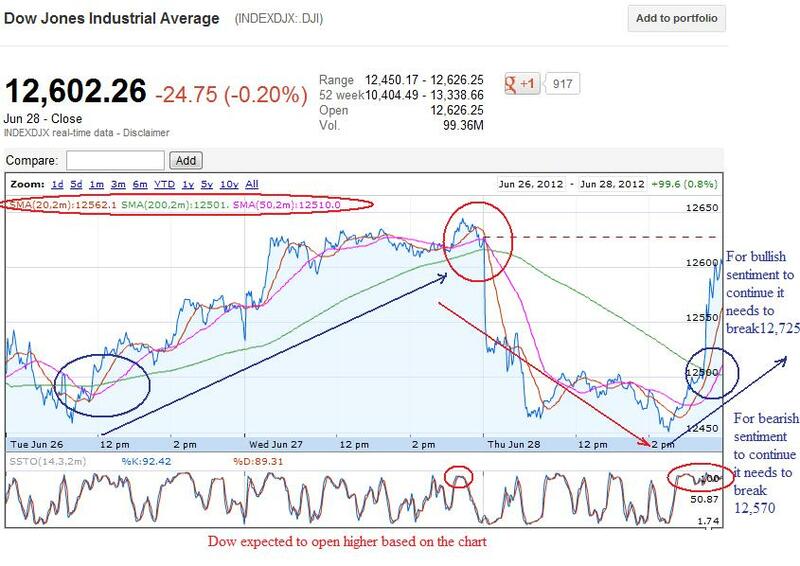 If the market opens high around 200 point then be short, and if the market open 100 points up, wait for the direction and look for the short term overbought and oversold condition to take appropriate position. 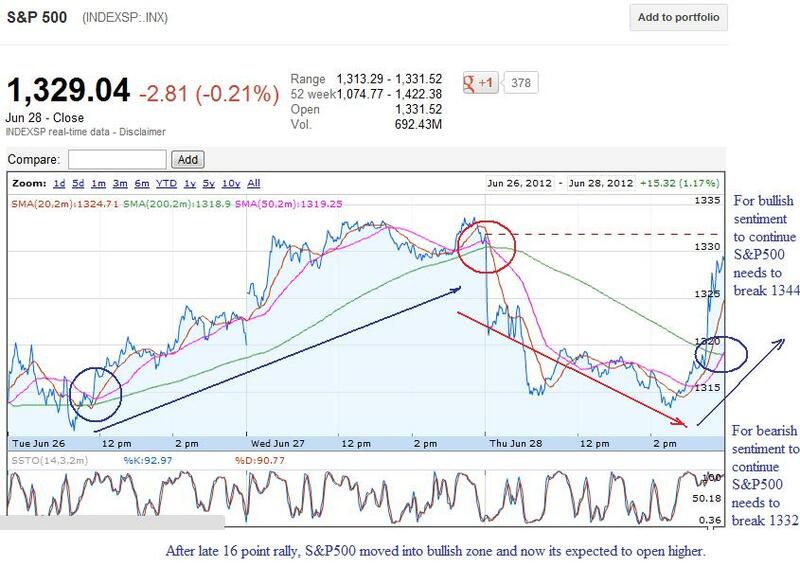 For Bullish sentiment to continue: Dow needs to break 12725, while S&P500 needs to break 1344. 8:30 a.m.: Personal income and consumer spending for May, released by the Commerce Department. 9 a.m.: Hearing on the American Energy Initiative, and a focus on EPA’s greenhouse gas regulations, at the House Energy and Commerce subcommittee on Energy and Power. 9:45 a.m.: Chicago PMI report on manufacturing activity in the Chicago region in June, released by the Institute of Supply Management. 9:55 a.m.: Consumer sentiment for June, released by the University of Michigan and Thomson Reuters. Stocks for Option Trading: NKE, NYX, CAT, XOM, SPY, QQQ, IBM, PCLN, AAPl, WLT, PCX, GOOG, MT.